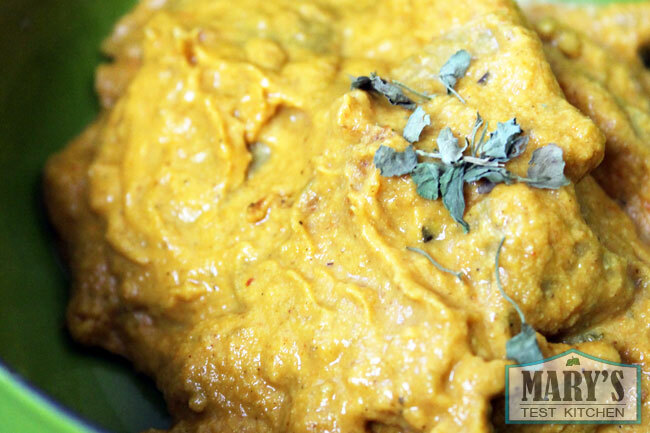 Looking for Bengali Cholar Dal? Click here for the printable recipe. 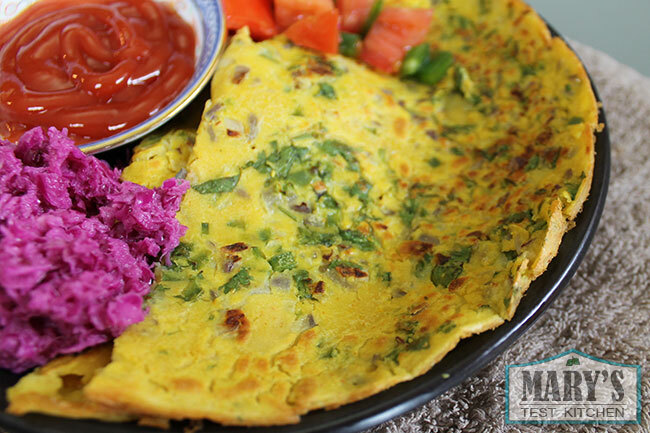 For this video cookbook review, I tried three recipes: Mom’s Chickpea Flour Pancakes, Split Pea Soup with Spices and Coconut and Butter Seitan Curry. I love using chickpea flour for Burmese Tofu but have few other recipes to use up the huge bags that I usually buy. So I was excited to try the savory pancakes. The batter is thinner than what I usually have to chickpea flour “omelettes”. Perhaps that’s why they turned out better! The spices made these pancakes just full of flavour; super addicting. 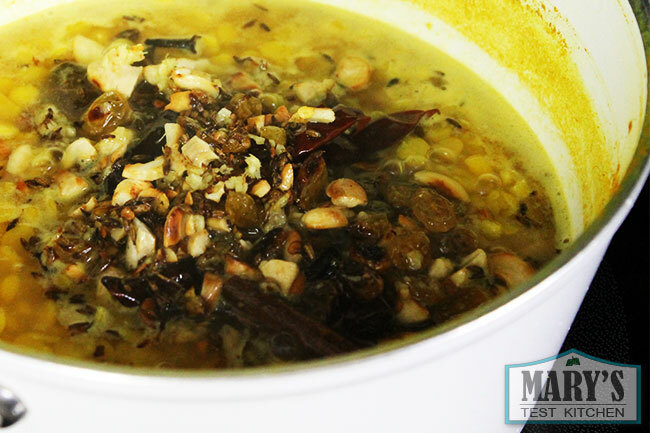 The next recipe I tried was the Split Pea Soup with Spices and Coconut, also called Bengali Cholar Dal. It’s just totally different than anything I would make myself; raisins in soup? I was sold! Tempering added to the cooked split peas.. 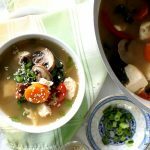 The resulting soup is full of different textures, with sweet, savory and spicy flavours, and super satisfying. I had one bowl after another. The recipe says that it serves 4 but I ate almost the whole pot in one sitting because it tasted so good. Click here for the recipe. 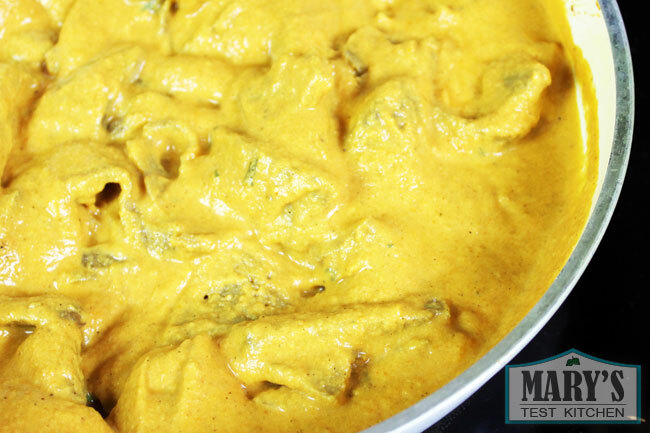 Finally, I had to try the Butter Seitan Makhani, the veganized version of Butter Chicken. I love my “Cheater Butter Chicken” recipe but I knew Richa’s would be better. It does take a little more time and effort but I think it’s well worth it. This curry tastes exactly like my favourite butter chicken from my pre-vegan days. Now I’m addicted and I’ve been having this vegan “butter chicken” almost every week. Sometimes multiple times a week. I hope you give some of these recipes a try. 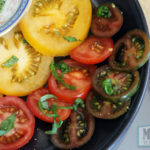 Let me know if you have any other favourites from Vegan Richa, whether it’s on her blog or in her book. Even if you are new to Indian cooking or Indian food in general, this book makes it really easy to look for ingredients, make substitutions, and dive right in. There is an extensive section explaining spices, grains, pulses and other ingredients, some particular cooking techniques, and the equipment that you’ll need. You won’t need anything special though. This book was written to give you authentic Indian cuisine that can be made in a North American kitchen. I highly recommend it as every recipe I’ve tried has been a hit! You can buy Vegan Richa’s Indian Kitchen here. 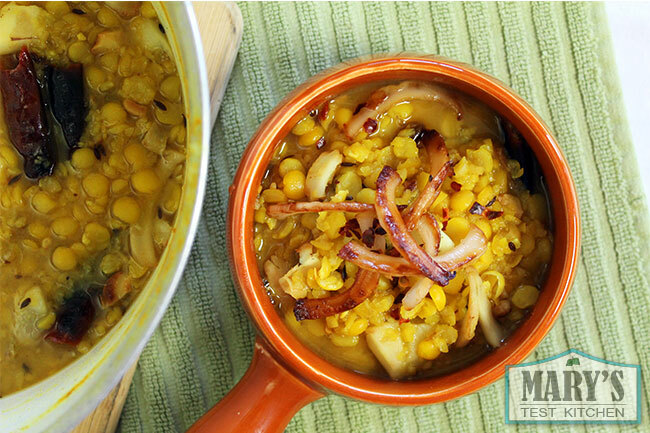 For the dal, combine chickpeas with water and turmeric in a saucepan. Partially cover and cook over medium heat for 30 to 40 minutes, or until peas are very tender. Stir in salt and sugar. 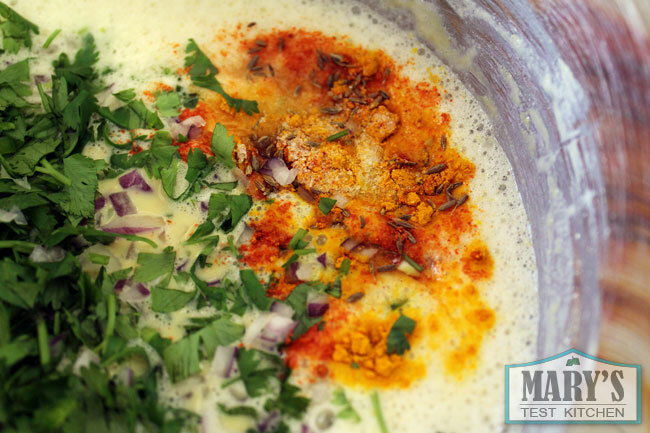 Reduce heat to low and simmer while you combine the spices. For the spice blend, heat oil in a small skillet over medium heat. Add coconut flakes and cook until golden, about 1 minute. Remove coconut flakes from pan and set aside. Add cumin seeds, cinnamon sticks, cardamom seeds, bay leaves, and cloves to the hot oil, and mix for 1 minute, or until fragrant. Break red chiles in half and add to pan. Add ginger, cashews, and raisins and cook until cashews are golden, about 1 minute. Add this to the simmering peas and mix well. Mash some of the peas if needed. Taste and adjust salt and spice, if needed. Stir half of the golden coconut flakes into the peas. Simmer covered for 5 minutes. Garnish with remaining coconut flakes and red pepper flakes. Remove cinnamon and bay leaves from peas just before serving.